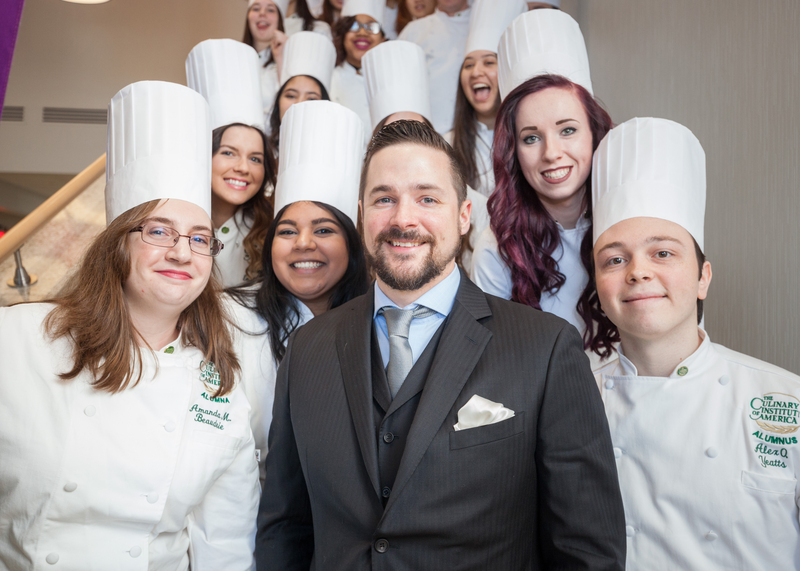 Hyde Park, NY – Nicholas Elmi, chef and owner of the acclaimed Restaurant Laurel in Philadelphia, spoke to the graduating class of The Culinary Institute of America at the college’s New York campus on March 3. He was recently announced as a 2017 James Beard Foundation Award semifinalist for Best Chef: Mid-Atlantic. He was a semifinalist for the same award in 2015 and Laurel was a semifinalist for Best New Restaurant in 2014. Since its 2013 opening, accolades have been pouring in for Laurel. In addition to the recognition from the James Beard Foundation, it made GQ’s 25 Most Outstanding Restaurants and Philadelphia magazine’s Best Restaurants lists and earned four “bells” in a Philadelphia Inquirer review by legendary critic Craig Laban. Next door to Laurel, in the city’s East Passyunk Avenue “foodie” district, the 2002 CIA graduate opened a second restaurant: ITV (In the Valley) Wine and Cocktail Bar. He is also developing a Mediterranean bar and grill concept to open in the Philadelphia International Airport. Between running his restaurants and supporting organizations such as the March of Dimes, Parkinson Council, and Philadelphia Animal Welfare Society (PAWS), Chef Elmi found time to compete on Top Chef. In 2013, he beat 18 competitors to win the 11th season of Bravo’s highly rated cooking competition show. Chef Elmi spoke to 62 recipients of CIA associate degrees in culinary arts and baking and pastry arts. The entire graduation ceremony can be seen online.